It’s that time of year again with the FreeFrom awards kick off again. If you have eczema, psoriasis, rosacia or sensitive skin or are just looking for some lovely natural skincare products check out their website and follow the awards progress on Twitter. I have discovered some lovely products through being a judge in the ‘problem skin’ category. The fourth annual FreeFrom Skincare Awards open this year on February 2nd. Run by skincare health site Skins Matter, the Awards celebrate the best skincare products that are ‘free from’ allergens and other ingredients which many consumers now look to avoid. “We’re particularly excited about the new ‘Fresh and Fragrant’ category, because it means many companies specialising only in perfumes and scents, toothpastes and mouthwashes, and feminine hygiene will be able to enter the Awards for the first time,” says Alex Gazzola, the Awards co-ordinator. The 2014 Awards open for entries on 2nd February 2015, and close on 15th March. Beauty Bible testing of all entered products takes place until April. Final judging sessions are in May, with the presentations to the winners taking place at the Love Natural Love Organic Show at Olympia on 3rd July. The Awards are run by Michelle Berriedale-Johnson, editor of the FreeFromMatters.com websites and founder of the hugely successful Free From Food Awards, now in their eighth year, and Alex Gazzola, deputy editor of SkinsMatter.com and a writer specialising in allergies and sensitivities. All winners were presented by longstanding supporter of the Awards, Janey Lee Grace (www.imperfectlynatural.com). 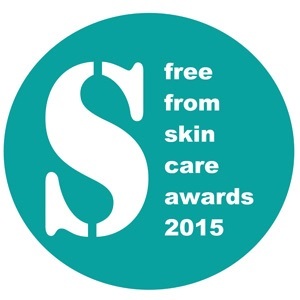 For more information, see www.freefromskincareawards.co.uk or contact Alex (alex@skinsmatter.com) or Michelle (infox@skinsmatter.com) on 020 7722 2866.